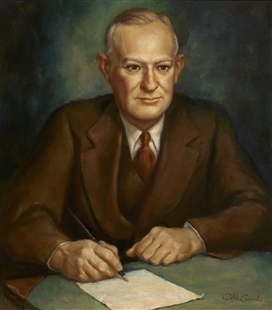 In this painting, the Agriculture Committee hearing room’s balcony provides a grand view of the Capitol dome and grounds. 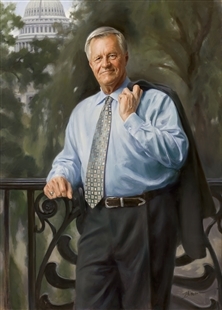 The portrait takes advantage of this enviable location, depicting Chairman Collin Peterson in an informal moment, leaning on the iron railing, suit jacket slung over his shoulder. Botanical motifs in the railing and the entire hearing room reinforce the committee’s concern with farm issues.